It has been challenging to grow your wealth investing in oil stocks over the past few years. Even though Baker Hughes, a GE Company (NYSE:BHGE) and Core Laboratories (NYSE:CLB) are oil services companies that don't directly generate revenue from producing the stuff, their prospects hinge wholly on the longer-term outlook for the industry. 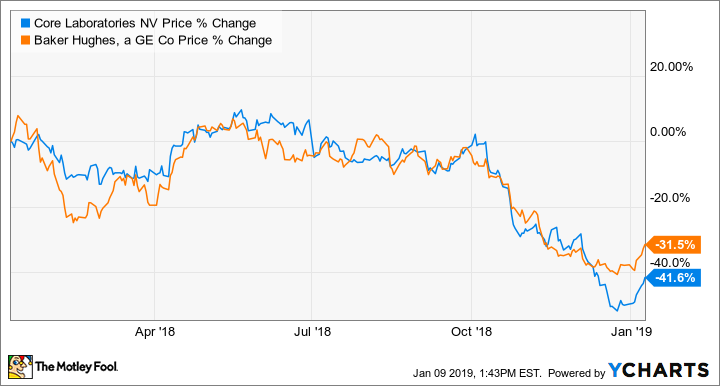 Being tied to the spending habits of producers could be a good thing over the next several years, which may have some investors looking at the recent price declines as buying opportunities for these two stocks. So let's take a look at what could make these stocks soar over the next few years, and which one investors would be better off buying today. Capital spending for the oil and gas industry is like trying to refill a leaky bucket. The natural decline in production from existing reservoirs and simultaneously growing demand represent the "leaks." The rate at which the bucket gets filled is the industry's capital spending. Because of the ups and downs of oil prices, the flow of capital is never consistent. From 2010 to 2014, concerns that we would be in a constant state of undersupply kept oil prices high, and companies were spending money hand over fist to explore and develop high-cost sources. At the time, shale drilling was one of those high-cost sources. The thing that is different with shale, though, is that to go from an undisturbed field to a producing well takes a matter of weeks, instead of the years other production sources typically require. This short development time led to an unprecedented production surge, which, when combined with longer development time projects going live, led to oversupply and the price crash we saw from 2014 to 2016. Since then, capital spending budgets have been cut significantly. Low spending rates are problematic for Core Labs and BHGE because capital spending is their lifeblood. They depend on producers to spend on developing and producing new sources; the larger and more complex the job, the better for oil services companies. The good news for oil services companies is that the lack of spending today is likely to require greater spending levels down the road. At current production decline rates, we have to replace about 3 million barrels per day every year. Also, historical demand growth suggests we need to add 1.5 million barrels per day annually. The current slate of major capital projects will only deliver about 1 million to 1.5 million barrels per day of new production annually between 2019 and 2021. If shale and other quick-to-market sources can't cover the difference between expected shortfalls and scheduled capacity additions, we could be headed for a prolonged stretch of undersupply that will lead to another wave of capital spending on more expensive projects. This bodes well for both of these oil services players. Buy the emerging giant or the focused niche player? BHGE and Core Labs may be in the same industry, but that's pretty much where the similarities end. BHGE is one of the big three in the oil services industry (along with Halliburton and Schlumberger). It provides both services and equipment for companies large and small and in every part of the oil value chain. In addition to serving producers, it is one of the important equipment makers for the refining industry and has a major hand in building the cryogenic equipment to produce liquefied natural gas (LNG). Core Labs, on the other hand, is a smaller player that specializes in one thing: optimizing oil reservoirs for production and longevity. The primary focus of this business is analyzing core samples from a producer's exploratory drilling to determine how to best produce from a new reservoir or to enhance production from an existing one. It has also developed a suite of products and services designed to improve fracking, the process used to access shale gas. Much of Core Labs' work is laboratory analysis. As a result, it has relatively low capital spending requirements and can generate free cash flow even when the industry is in a period of weakness. Conversely, BHGE's large equipment-manufacturing footprint and providing a wide array of services mean it has to spend a lot more to keep its daily operations going. Also, because BHGE has been a combined entity for around 18 months, management is still in the process of integrating the two businesses. That has been an expensive task that has hurt the company's financial results. Because BHGE is still in the middle of integrating into a single entity and serves multiple parts of the oil and gas industry, the company is hard to understand. Some of its business lines have done well, but it has struggled recently to secure big-ticket equipment orders. Perhaps once management completes the integration and is able to realize the operational synergies it promised, the company will be in a good position to succeed as producers spend on expensive equipment such as subsea production gathering networks and natural gas liquefaction equipment. Until we see tangible evidence of this, though, there'll be uncertainty as to the company's ability to realize the cost benefits of being a single entity. For now, Core Labs looks like the better investment. The future of the business is easier to understand, and it doesn't face the challenges of an integration plan. Also, management has done a great job of keeping costs down and preserving its balance sheet through this downturn. With shares trading at their lowest prices this decade, there is a great opportunity here when capital spending in the oil patch picks back up again. Check out the latest Baker Hughes and Core Laboratories earnings call transcripts.